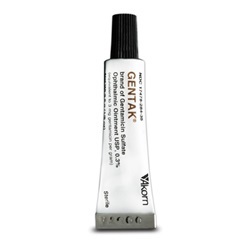 Sterile Gentak gentamicin 0.3% ophthalmic ointment in 3.5gm tube. Methylparaben and Propylparaben preservatives. Manufactured by Akorn. NDC Number: 17478-284-35. Comes as singles.